BoXXerworld is the only company in the world to do professional graphic designs of every garment produced, believing it’s essential to achieve excellence of design and eliminate errors. The company has also developed and tested all their own garment patterns over several years, believing what was available on the market was not good enough. “In my opinion a lot of the jackets available looked like pajama tops and the shorts designs were too narrow in the leg or just not right in the crotch…. It took years of designing and redesigning to get our garments just right. We are constantly developing new products to offer something better,” says Laura. With the right colour combinations and bright, vibrant designs being essential in front of TV cameras, BoXXerworld’s materials have also taken years of combing the world’s fabric markets to find. The results of this hard work have paid off, with many of the UK and Europe’s champions now appearing on Fight Night wearing BoXXer products. BoXXerworld has also developed a full range for female martial artists. The International Amateur Boxing Association's mooted plans to require female boxers to wear skirts in the London Olympic Games has caused an international outcry, focussing international media attention on the sport. An online petition has gathered upwards of 50,000 signatures against the idea of female boxers being forced into skirts. Despite the Olympics being only being months away and teams around the world needing to make their team uniforms, the decision has not yet been made and no time frame has yet been given. As the founder of a business which makes high end boxing gear for many of the world’s top boxers such as Roy Jones Jr, Mikkel Kessler, Nathan Cleverly and Kevin Mitchell, Laura Saperstein has recently been asked to produce designs for gear for the Ireland boxing team (through ASICS). Katie Taylor boxes for Ireland and is one of the most successful female amateur boxers ever (she is yet to be defeated in multiple world and European Championships) and Katie has steadfastly refused to be seen in a skirt and says she will not be wearing one in the Olympics no matter what anyone says. BoXXerworld has produced a sample outfit for team Ireland but I don’t know what to make for Katie. Further, as a maker of sportswear, Laura knows how long it takes to develop and refine quality garments… this is not something that can be done in a few weeks. Laura believes that a proper consultation process should have been commenced with female boxers more than a year before the gamers were to commence to give everyone a time to adjust to any new uniform and to give proper time for the new garments to be developed. To get in touch with Laura, visit our contact page. Laura Saperstein boxed again at York Hall Bethnall Green on Sunday night 20 June 2010 and remains UNDEFEATED in a milestone TEN fights. Laura gave away nearly a stone in weight to tough veteran of 32 pro fights, Bulgarian Borislava Goranova, but impressed with her technical skills, winning all six rounds to cruise to a comfortable points victory. Laura has been offered a word title fight, but the Aussie-born English citizien wants to purse an English and British title fight first within the next few months. “Financially it’s very difficult, and it might be easier with a big title behind me, but I’ve wanted to do things the right way round and having a legitimate English or British Title behind me and boxing next to the men I’ve grown alongside in the gym would be a dream come true”. Laura will be in action again at London’s York Hall, Bethnall Green on 20 June 2010, following a controversial majority decision draw in her Ninth pro fight in Tirana, Albania. Laura took on the very experienced pro and talented amateur, Daniela David from Romania, over 6 rounds on the under card of the May 2 WBF World Title fight between Kresnik Qato of Albania and Estbeban Ponce from Argentina. Laura says it was a great honour to box on a Live TV show immediately before a World Title Fight and to take part in the first ever female boxing contest in Albania. Laura admits to being pushed during her first six round experience but believes the decision should have given her a 9th clear victory. “It was a tough fight; Daniela is a very experienced boxer”. Saperstein refers to the fact that David has been in ten-round World Title fights on four previous occasions and has and has 25 pro fights and 71 amateur fights to Saperstein’s 9 pro fights and 10 amateur fights. 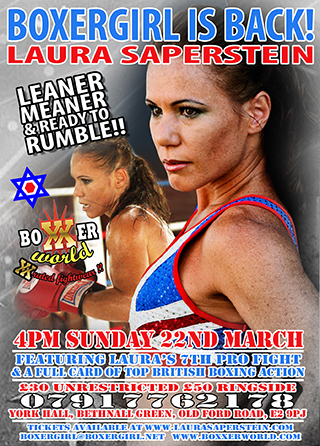 Tickets for Laura’s June 20 fight wil be available here very soon. On 21 March 2010 at York Hall, Bethnall Green, London, Laura Saperstein made it eight straight wins in her pro career so far against Welsh Super Featherweight, Lana Cooper. Laura now has her sights firmly set on domestic and international Titles in 2010. In the immediate future she is looking for opportunities to box over longer rounds either in the UK or abroad. Laura is actively seeking opponents at Super Featherweight and hopes to secure sponsorship to help towards her Title ambitions this year. Any opportunities should be directed to the Contacts to page of this site. Giving away 9 pounds in weight, working with a new coach, and taking on late replacement Galina Gumliiska of Bulgaria, Saperstein managed to turn around difficult circumstances to score a decisive victory at York Hall, Bethnall Green, London on motherÃ‚Â’s day (22 March 09). Ã‚Â“It was pretty stressful stuff; late on the Wednesday night I got a call from promoter Miranda Carter, to say my scheduled opponent, Lana Cooper, had pulled out with the flu. I couldnÃ‚Â’t believe it as IÃ‚Â’d battled twice with the flu in the three weeks before the fight but was still willing to get in there!Ã‚Â” says Laura. The Saperstein camp spent the next three days making frantic arrangements to find a replacement and fly in the Bulgarian veteran of 24 fights just in time for the Sunday event. Ã‚Â“We were all in a bit of a panic, trying to get everything cleared with the boxing board and making all the travel arrangements. I had no idea what weight my opponent would be and knew she was very experienced, having been in with several champions. I was doing media interviews, running around finalising ticket sales and worrying about what shoes I was going to wear after the fight!Ã‚Â” Saperstein laughs. Ã‚Â“As it happens I chose some that nearly crippled me! Next time itÃ‚Â’s Ugg Boots for sure!Ã‚Â”. Saperstein began the fight working behind the jab but, spurred on by an increasingly vocal crowd, she managed to land some solid straight rights and left hooks through the second and third rounds, coming tantalisingly close to a stoppage victory, but not quite close enough. The fight went to the score cards with a unanimous 36-40 decision, Saperstein winning each round convincingly. Laura is now considering her next move, wanting to get back in the ring again as soon as possible to work on the improvements she and her coach have earmarked from her most recent fight. Laura is looking forward to working with Miranda, who, she says, puts on exciting shows that keep the fans entertained. Laura will be boxing Welsh professional fighter, Lana Cooper, at Super-featherweight. Tickets are only £30 (unrestricted) and £50 ringside. Available to purchase on the Tickets page of this site.